Volcano Watch: Where (and how) you gonna go when the volcano flows? The 1887 lava flow erupted from Mauna Loa’s Southwest Rift Zone crossed the government road (about a 1,000 feet south of today’s Highway 11), traveling 14 km (9 mi) in less than 9 hours. Photo by J.J. Williams, courtesy of National Park Service. In his popular single “Volcano,” Jimmy Buffett sings, “I don’t know where I’m a gonna go when the volcano blow.” His lyrics referred to Soufrière Hills, a then-dormant volcano on the island of Montserrat in the West Indies, where he recorded the song in 1979. Sixteen years later, the volcano erupted for the first time in over 400 years. Island of Hawaiʻi residents, especially those living in South Kona and Ka‘ū Districts, which are at particular risk from Mauna Loa’s Southwest Rift Zone, might also wonder where they’re gonna go when the volcano erupts—even if it flows, rather than “blows.” But, more than knowing where to go, a greater challenge might be how to get there. Hawaiʻi Island’s Highway 11 is a busy roadway, used by both residents and visitors to travel between West and East Hawaiʻi. When people drive the stretch of road between the South Point Road intersection (Ka‘ū) and Ho‘okena (South Kona), they likely notice the lava flows alongside the highway, but may not give much thought to the lava’s origin or impacts. In the past 148 years, lava flows erupted from Mauna Loa’s Southwest Rift Zone have crossed Hawaiʻi Island’s main road (now Highway 11) six times. The years in which these flows were erupted are labeled in red. The location of Hawaiian Ocean View Estates (HOVE) is shown for reference. USGS map. 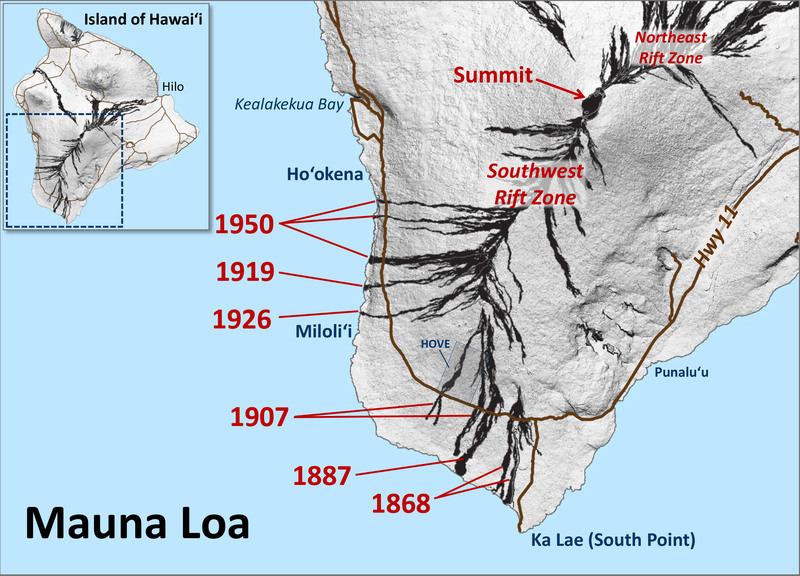 In the past 148 years, Mauna Loa Southwest Rift Zone eruptions have sent lava flows across the main road six times—in 1868, 1887, 1907, 1919, 1926, and 1950. Some of these eruptions sent more than one lava flow across the roadway, blocking traffic in several places for weeks or longer. The 1868 lava flow is visible from Highway 11 at mile-markers 70–72, just west of the South Point Road intersection. This lava flow was part of a series of events that started on March 27 with a brief Mauna Loa summit eruption, which initiated up to 100 or more felt earthquakes each day. 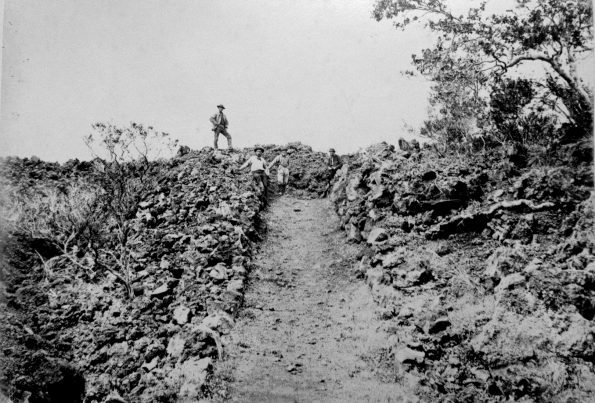 Then, on April 2, 1868, the strongest earthquake known so far in Hawaii struck. With an estimated magnitude of 7.9, this earthquake, probably centered in Kaʻū, literally knocked people off their feet—or off their horses, if they were riding—and destroyed rock walls and structures throughout the district. It also triggered multiple landslides, one of which rushed through a village as a mud flow that killed 31 Hawaiian farmers, and generated a tsunami that swept the Ka‘ū and Puna coastlines and killed another 41 people. Earthquakes continued for the next five days, but were weaker and less frequent. On April 7, a voluminous eruption began low on Mauna Loa’s Southwest Rift Zone. Lava gushed from a fissure and quickly advanced downslope, crossing an area of today’s Highway 11 and reaching the ocean, a distance of about 16 km (10 mi), in about three hours. Area residents fled their homes and escaped, but 37 buildings in Ka‘ū were destroyed. The eruption ended on April 11, 1868. Continuing west on Highway 11, near mile-markers 73–74, you can see the 1887 lava flow. The eruption started on January 16, when lava briefly broke out at the summit of Mauna Loa. Two days later, fissures on the volcano’s Southwest Rift Zone, just above what is now Hawaiian Ocean View Estates, erupted a channelized ʻaʻā flow that advanced 24 km (15 mi) to the ocean in about a day. The eruption, which was accompanied by frequent and sometimes strong earthquakes, shut off on February 2. The 1907 Mauna Loa lava flow crossed the government road (predecessor of Highway 11) in two places—near today’s mile-markers 75 and 78–79. 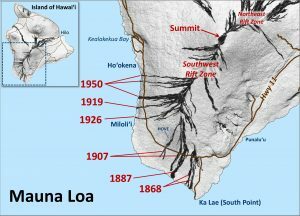 The 1907 eruption began just after midnight on January 10, when glow was noticed at Mauna Loa’s summit, followed four hours later by a Southwest Rift Zone eruption west of the 1887 vent. Lava spewing from this vent quickly split into two branches, changing from pāhoehoe to ‘a‘ā flows, reportedly up to 9 m (30 ft) thick, as they moved downslope. Within three days, both branches had crossed the government road, where they burned telephone poles, cutting off all communication, and blocked traffic. The 1907 flow did not reach the ocean, but had it not split, it might have. The eruption lasted about 2 weeks. The 1919, 1926, and 1950 Mauna Loa eruptions and their impacts on the circle-island road will be described in next week’s Volcano Watch. For now, think about where (and how) you’re gonna go when the volcano flows.